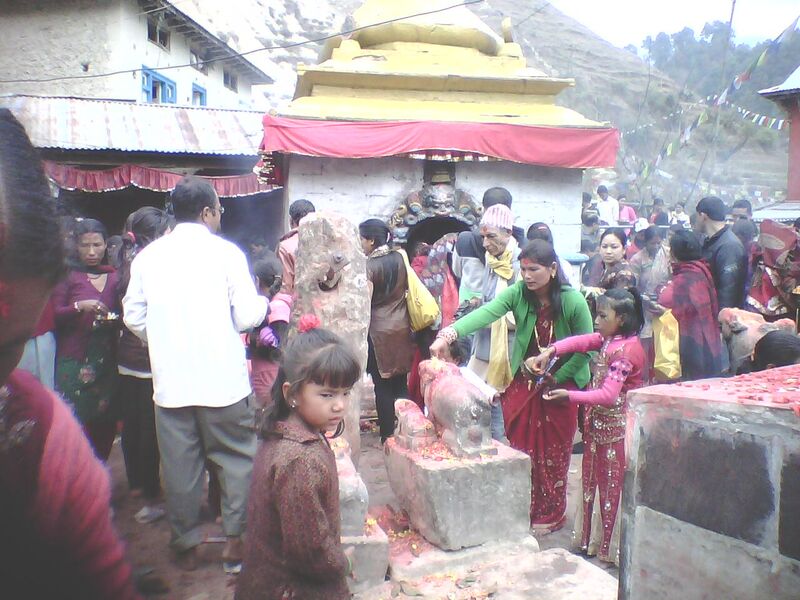 Maha Shiva Ratri is one of the most colorful festivals of Nepal and certainly one not to be missed if you plan to be in Nepal during late February or early March. I had such a good time last year at Pashapatinath that I decided to see it from another angle this year. Pashapatinath was so crowded last year, but it was quite nice. Festival days like this are good days to visit the big temples because the first day of the major festivals are usually a free admission day. If you go to the big, crowded temples on festival days be sure to watch for pick pockets and other types of petty crime. As I mention in my book, “Nepal-On a Budget,” leave important things in your room and bring only a small amount of money. 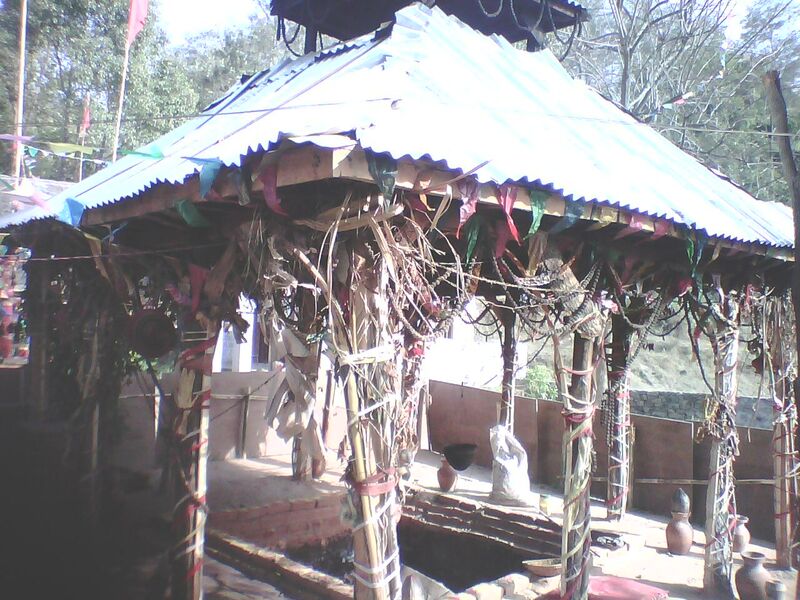 The goal of our journey was to enjoy Shiva Ratri at each of the temples dedicated to Lord Shiva along the way. 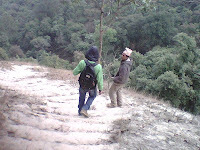 You do not, however, need to wait for Shiva Ratri to take this site seeing trek. These festivals are active, but each Monday you will see much more activity at these temples, as Monday is the day of the week set aside for Shiva. 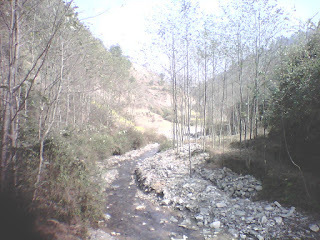 Although returning tourists will lament the sorry condition of Nepal’s rivers, as you can see by this picture, there are many pristine areas of the rivers throughout Nepal. This path is good to get a good warm-up hike prior to getting too far out of the valley. One reason to take this path is to go where others have not. Another reason, probably more valid, is for the spiritual experience. 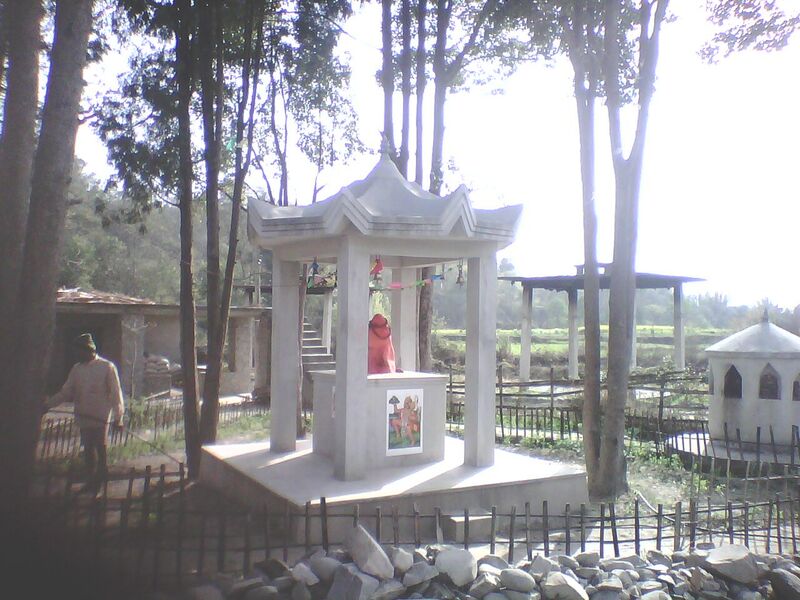 Each of these temples stand for a particular purpose, for a special spiritual need of the people. 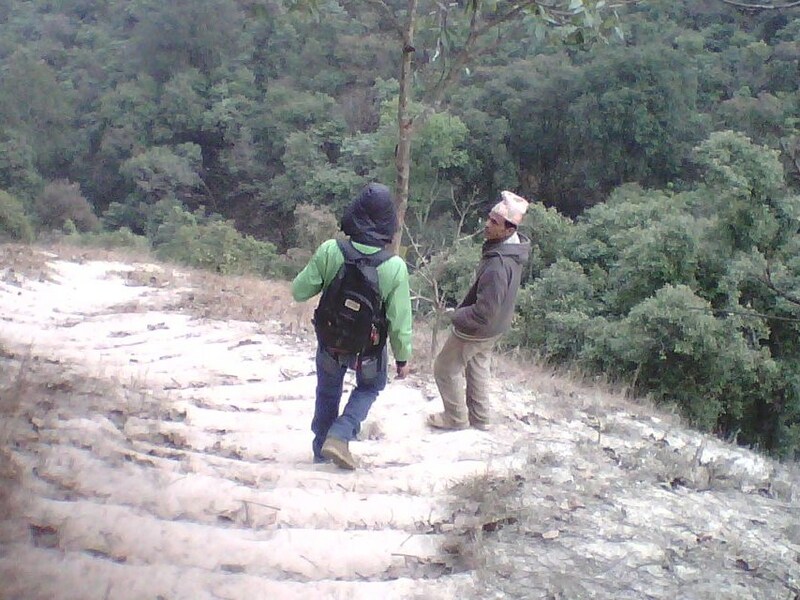 Although mostly unpaved, this is a fairly level road and only steep in a few places. You will enjoy lovely views of farm lands, villages and a bit of uncultivated land. There is also a short area where strip mining is taking place-not so pretty, but just a short span. Expect to get reactions from the local people; they do not see westerners as often as you might think. Children, particularly, will be eager to speak to you. One child along the way just couldn’t contain himself. “You are very white,” he told me in amazement. I was surprised at how well he spoke English, although it must have taken some time to put the sentence together. I laughed and agreed with him. It is a custom for children to put up road blocks during the first days of festivals whereby they hold the road for a ransom of 5 rupees. It was fun, but by the end of the day we were out of 5’s and started really going through the rupees. The children use the money for food during the festival when they sit by the fire and sing hymns. Along the way we had tea and ate at some very local restaurants-at some amazingly low prices. I suggest in my book, “Nepal-On a Budget,” that the rule whether to eat at a restaurant or not is that it have an actual door, but village cafes seldom have a door. 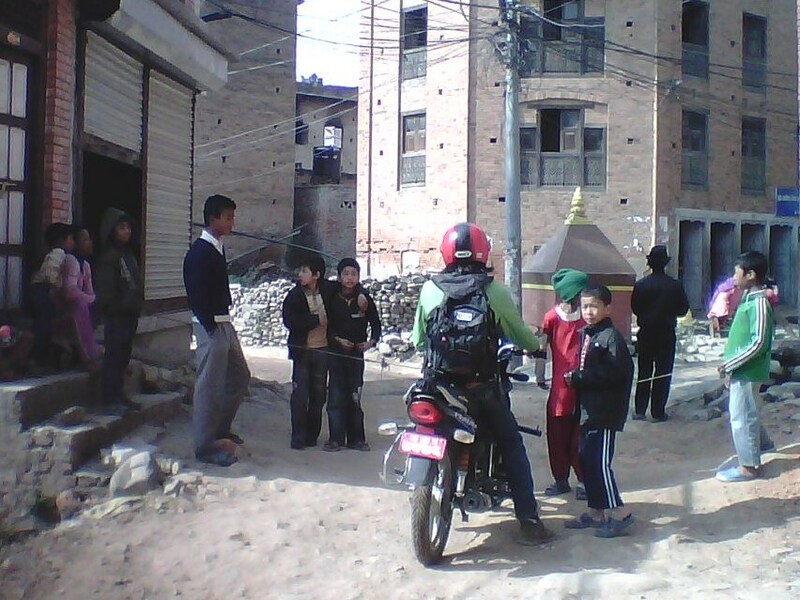 So, for lunch we ate in Banepa along the way-after the first temple. 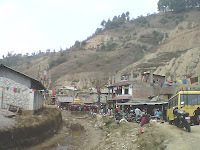 The restaurant, Gaulam Fast Food & Café, Banepa-5, Kavre. Phone: 01-663937. It is near the Nana Bus Park. 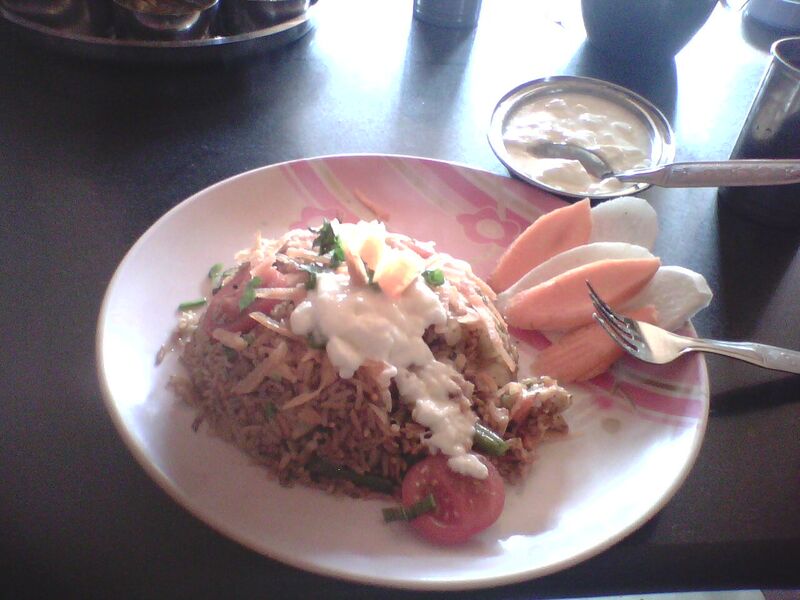 I had veg briani (90 NRs.) and curd (30 NRs.) 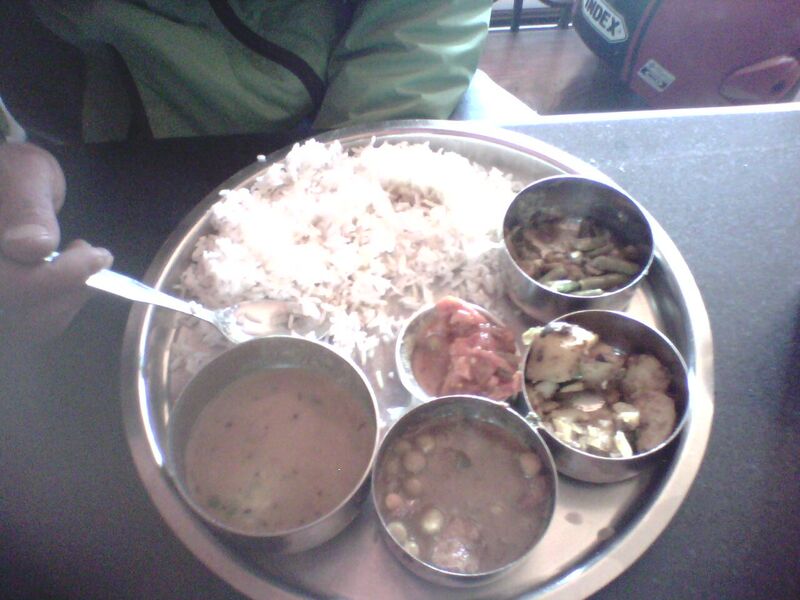 while Deependra had the veg set (90 NRs.) that came with rice, lentils, potato curry, peas paneer curry and pickle. Since it was Shiva Ratri, we focused mostly on the Shiva temples. 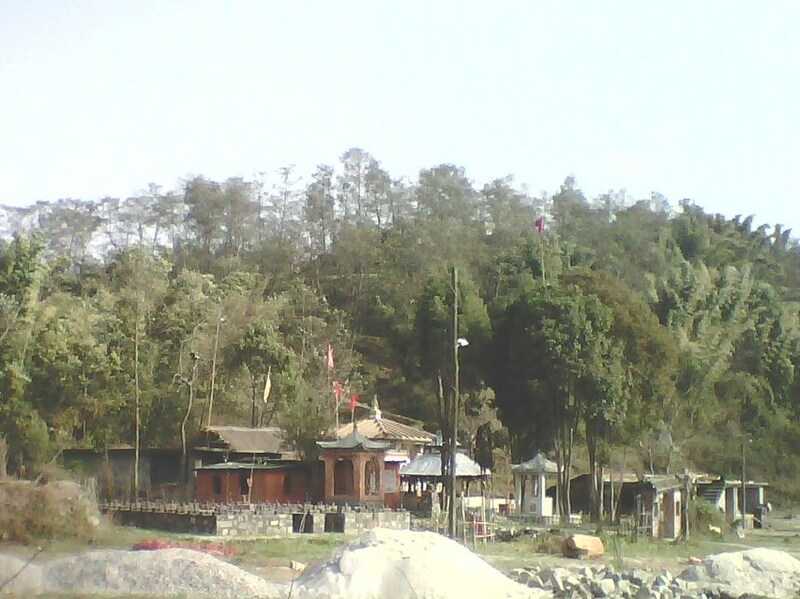 Our first temple was the Ashapuri Temple within a small village along the Ashapuri River, as pictured below. 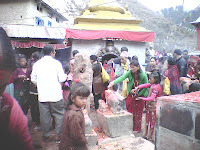 Each Monday people come here to pray to Lord Shiva for a child. 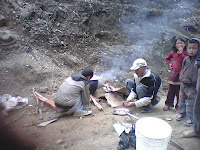 As we walked up along the river we came upon a couple of men preparing a special Shiva Ratri dish, Ghoto. This sweet dish is made from ghee and ganja, and would be eaten during the celebration later that evening. 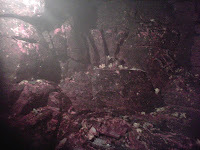 It is eaten in scoops during the ceremony and resembles cookie dough, both in consistency and taste. Along the path to our next temple we met a girl who gave us a Rhododendron flower. 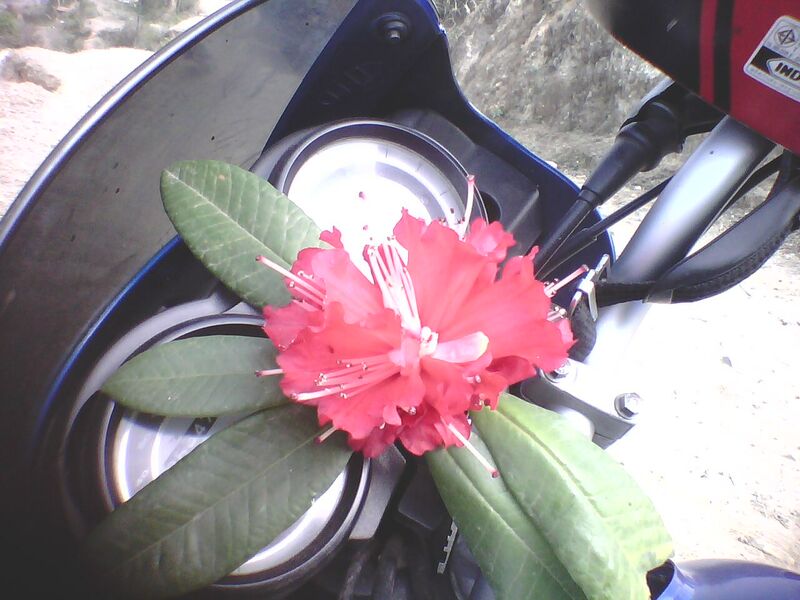 Deependra put it on the motorcycle and when he didn’t have a small note for a road block one of the boys grabbed a piece of the flower like it was a prize. Deependra explained that the children eat this flower like candy. It is used medicinally for sore throats and as tea. This Rhododendron tree happened to be growing along the road; it was huge. This Krishna temple stood at the junction to our next temple, Shapaneshowor Mahadev Temple. 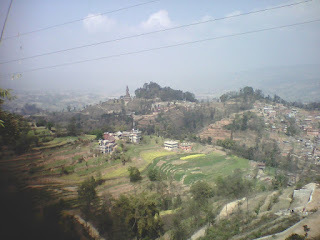 While still on the road to Nagarkot, we stopped and walked down the mountain via steps and then continued through the woods for about ten more minutes to the remote, yet active temple grounds. If you would like to bring a sleeping bag and a few supplies you are welcome to stay in the little house there next to the temple; bring what you want to eat, build a camp fire and enjoy. This is actually an exclusive for my blog and book readers. Please leave everything better than you found it and/or leave a donation for the village-not required. If you would like to have a baba come to do Aradi or meditation you may call the owner of the property, Sam Gruing at 980 809 6055. This could be a two night trek by staying here one night, then going on to the final temple and back to the base camp for a second night before going on to your next activity. This is both the outside and inside view. 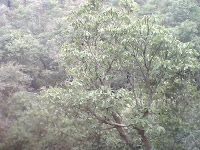 It was quite an experience to sit inside and feel the essence of Lord Shiva. We walked back up the hill to continue on our way. 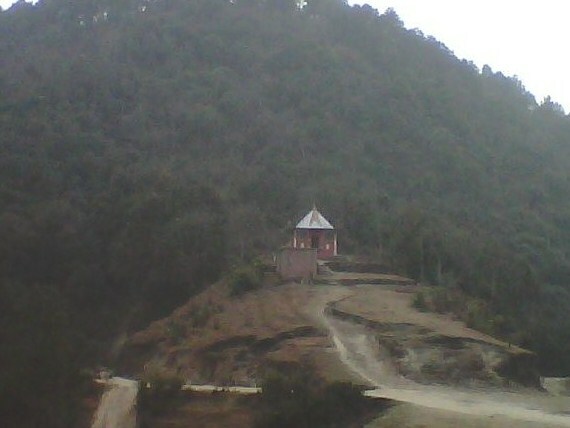 However, if you wanted to cut the trek short this would be an easy exit point by continuing passed the temple to the paved road on the other side. At that point, you could flag a bus down and go back to Bhaktapur or Kathmandu to your right (west) or to the left to go on to Nagakot. Taking the bus toward Bhaktapur, Banepa is the junction for connections to places like Dhulekhel, Langtang, Mt. Everest, Ghoraphana, etc. 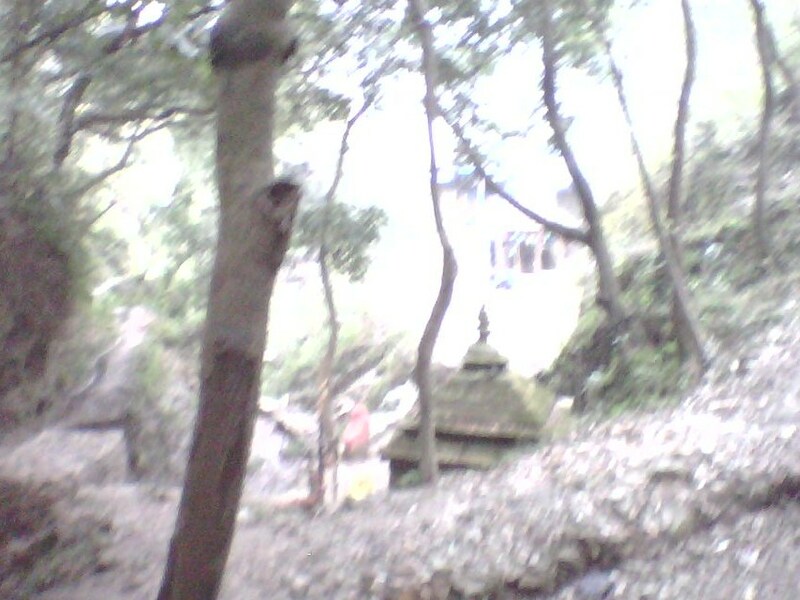 Our next and final temple for the day was the Marnika Mandev Ghat Temple. 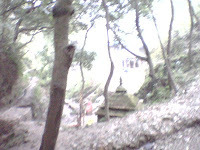 We walked across a tiny bamboo bridge to a thigh high Shiva Linga labyrinth of 64 Shiva Lingas. They were all lit when we arrived, as it was approaching dusk. The grounds were quite nice with a large cremation area. It is very good from a Hindu prospective, to see a dead body. The temple is newly constructed and built in the traditional style. The Kalan Baba was just about to perform Arati, a beautiful ceremony of lights, when we got arrived. I watched in amazement. As the baba came out there was an entourage of devotees following behind playing drums, harmonium, tabala, chan chen, all indigenous instruments to Nepal. The energy was invigorating. Afterwards, we were invited into the meditation room to enjoy hymns with the devotees and guru. I was the only woman among 25 or so men. Some played drums and one young man played the harmonium. I had never seen this instrument before. It had a flap to bring in air similar to an accordion, as was the sound. The difference was that this instrument sat on the floor like a miniature piano. One of the men assured me that had it not been for load shedding, there would have been many more instruments. Although there were no song books, everyone seemed to know the words and it was delightful to hear them sing. As the guru stirred the fire burning embers rose in the dark, creating one of those magical memories to ponder in my later years. 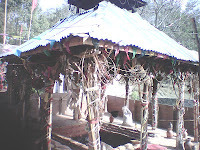 There are two other temples on the grounds, one for Krishna and one for Hanuman. This day was a delightful celebration for Lord Shiva. This trek is literally a free trek and can serve you by filling in a few days in between your normal, more costly activities. 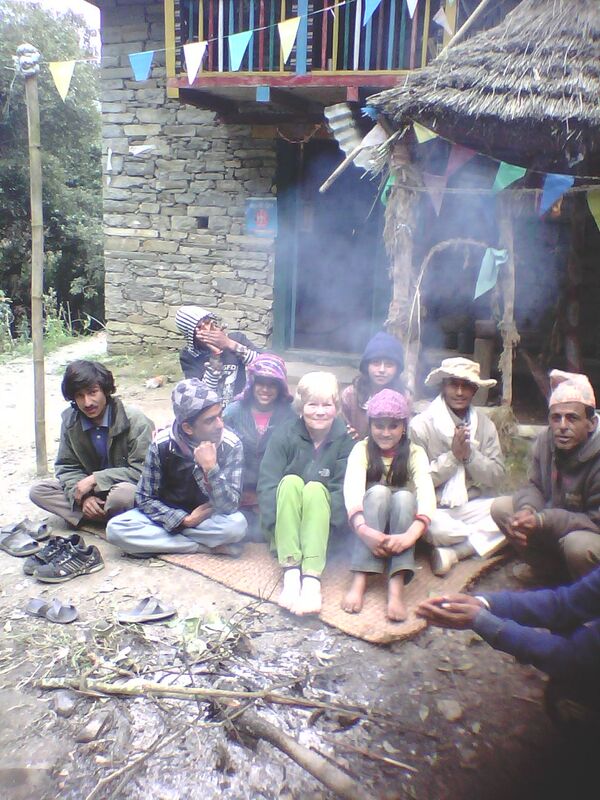 You do not need to wait for Shiva Ratri to enjoy this trek. Each Monday is devoted to Lord Shiva and the temples are all accessible any day of the week. Here we are with a group of friends around a fire who really made my time special. You can see the girls with hats in this picture. I had been buying hats throughout the year when I saw them on sale and had way too many hats. I took them this day and found these girls were happy to get a new hat. They were delightful and spoke pretty good English. This is the home that is offered to trekkers; it even has electricity. This trip was one of the most enjoyable days I’ve had in the area. 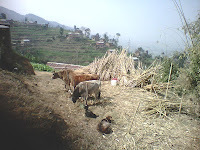 You will see so many scenes like this one, the culture and way of life are the way things have been done for thousands of years. It’s like time has just stood still for these villagers.